Anyway, about this week’s post. 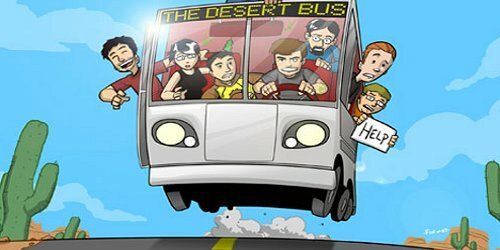 For those of you who don’t know read my post, it explains what ‘Desert Bus for Hope’ is pretty succinctly. Or watch the Desert Bus for Hope 5 opening. My writing here is far more emotional than per my usual style, but I think that conveys what I felt for the majority of the event. For everything going wrong it’s just nice to see something unequivocally good happening for once. And it isn’t just a single moment, but the constant building up of good feeling, the ongoing and pervasive ethos that seeps into your psyche over the span of days. It’s damn entertaining at times too. I glance over some of it, but to supplement my external post, this time I’ll do it with a bunch of YouTube highlights. One of the more amazing musical performances from the event. The Game of Thrones theme done on acoustic guitar and kazoo. A bunch of other people also have fun with the them in the background. Dubstepping became an ongoing theme of this year’s Desert Bus for some reason. I guess because that’s what is popular on the internet right now. Anyway here’s one of the LoadingReadyRun members “Wubstepping” while being made to wear a large and increasingly ridiculous number of hats. I have no idea. Just realize I saw this around 2 am and I missed what it was or why they were doing it. My confusion that I had expressed in the chat gets mentioned on video at the end. This is the auction of the whole show. While all of them were exciting to some degree, this one take the cake for sheer wow factor. I chose this version of the video because it included the chat window where the bidding is going on. The whole event the video was slightly delayed behind the chat. they saw it instantly but the feed back took anywhere from 10 seconds to a minute at times. And for all the Brony and Pega-sis fans out there. My Little Pony: Friendship is Magic was another running theme throughout Desert Bus 5. Any yes that is Kroze doing one hell of a Fluttershy impression. This is what happens when a bunch of people stay up all night and run out of steam, but force themselves to be creative. Also, yes that is a Discord costume Kroze is wearing. And this is a video I had to find and record myself after the fact because I missed it live because I walked away from my computer for 10 minutes. I’ve been told it was probably was a good thing for the sake of my heart. This is only a small taste of what Desert Bus had to offer and a slice of the personalities that make up the event. I said it had a grammar and social structure all its own. You see some of that here, but no where close to all of it. There is so much more and a ton of it made it YouTube mere minutes after it happened live. You can also watch the whole thing unedited if you feel like going to those lengths. Again, read my first post to appear on PopMatters.